“Swearing Off Stars” by Danielle M. Wong tells the spellbinding tale of secret love and gender equality. When Lia leaves her strict family home in Brooklyn to be a student at Oxford University, she has no clue how her life will change. In the 1920’s, Oxford University was not a welcome place for female students. They could attend classes but were allowed no voice in class or a degree. When Lia meets Scarlett Daniels on campus, she is immediately drawn to the beautiful aspiring actress, in spite of having a boyfriend waiting for her at home. This is not a safe time for homosexuals to be open. The punishment for being caught could be as severe as having to get a lobotomy. Because Scarlett wants to be a star, she has to be extra careful about hiding her forbidden relationship with Lia. While these two women are trying to sort their feelings out, they are also actively engaging in protests on campus. Their goal is to achieve gender equality. Both ladies have reasons for keeping their love a secret, and because of the hurt caused by this secret, their relationship falls apart until they are once again drawn to each other years later. They have to work through their issues and decide if the time is right for them to show their feelings to the world. 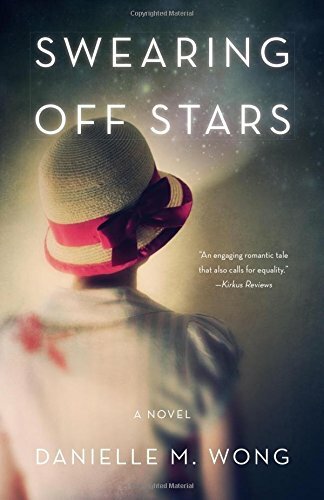 “Swearing Off Stars” is a powerfully written novel. The two heroines in this story are way ahead of their time and this causes them a great deal of suffering. On the other hand, it also gives them a chance to be part of the gender equality movement, which enables them to make a difference for others. The development of their characters is exceptional. The author takes us into their minds and hearts to gain a better understanding of the choices they make, and it is fascinating to see them evolve as time passes. The story begins with them having to travel by ship and it ends with them being able to fly. As women, they also gained more rights but they still were not where we are at today, so their chances of being able to be together is still tenuous. “Swearing Off Stars” by Danielle M. Wong is an engrossing, thought provoking novel that will be enjoyed by all readers of quality fiction.